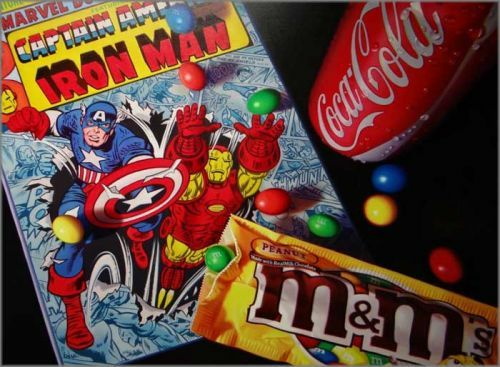 Doug Bloodworth limited edition giclée on canvas:"Captain America"
About the Art:You are probably a Captain America and Iron Man comic fanatic, in which case it is probably bothering you to no end that these M&Ms have been spilled onto the comic book. Check out the ridges and the folds in the M&Ms bag. Check out the way the light hits each of the M&Ms differently. It's uncanny. Even after a year, you will still notice new things in the painting whenever you look at it. Doug loves inserting unique things that take careful viewing to notice. For example, did you notice the things that are being said in the background bubbles? Also, did you notice where Doug hid the name of his daughter - Bini - in the painting? There are other things like that as well, and you will notice one at a time over the years.